Immaculate hardwood floors are a beauty to look at and according to a survey done by the National Association of Realtors 54% of perspective home buyers are will to pay more for a house that has hardwood flooring. When it comes to cleaning hardwood floors it isn’t the wood that determines how you clean it but the finish. Most hardwood have a protective coating using polyurethane or other clear coat. This layer of coating protects it from water, abrasion and other contaminants from daily use. Unless your home is more than 30 years old and did not go through major renovation, it most likely has sealed hardwood. A hardwood floor is an investment worth protecting. In order to do that, you’ll need the right tools and have knowledge on how to use these tools effectively to keep hardwood in pristine condition. This is perhaps the easiest way of maintaining the value of your home in the long run. And avoid costly repairs that could easily drain your wallet. Using the wrong type of cleaner can ruin your floor over time or at the very least make it dull and in need of refinishing. Avoid using cleaners specifically formulated for vinyl or tile on hardwood. The American Hardwood Information Center (AHIC) warns against using wax-based or petroleum-based products because these can damage the finish. When in doubt try contacting the installer and ask the type of finish, if that is not possible, use a generic floor cleaner. One such brand would be the Bona hardwood cleaner. It comes in different formulations like concentrate or spray. Match this with their signature mops and other products and you have a winning combination. The spray is particularly useful for spot cleaning or treating anything that requires a bit of extra attention. Concentrates are best to keep around for major cleaning when a dust mop just won’t do. Old fashioned? Yes but still effective. When shopping for one, look for something with exploded tips. To speed up the sweeping process, you could use a vacuum cleaner. There are several types in the market. Choosing one will be dependent on your needs. For smaller homes, a more compact stick vacuum. Larger homes would benefit from a canister or upright vacuum. Robotic vacuums are also a great deal of help because it cleans autonomously and on schedule. Dirt like sand and soil can scratch the hardwood, strip off its protective coating and dull over time. Dust mops is a nice to have tool to have cleaning such debris. This tool attracts statically charged dust off hardwood and a must have if you are serious about keeping your floors clean and last longer. Bona recommends that you buy a dust mop with a machine washable microfiber head – it makes your life a whole lot easier. After moping, just throw the mops inside a washing machine. A quick sweep with a dust mop goes a long way towards getting a longer and more beautiful result from your floor on a daily basis. The beauty of a microfiber is it absorbs dirt, not just drag it around. This lessens the risk of scratching and eventually dulling. Plus you don’t have to worry about lints all over the place. Only use a mop if you’re cleaning dust. 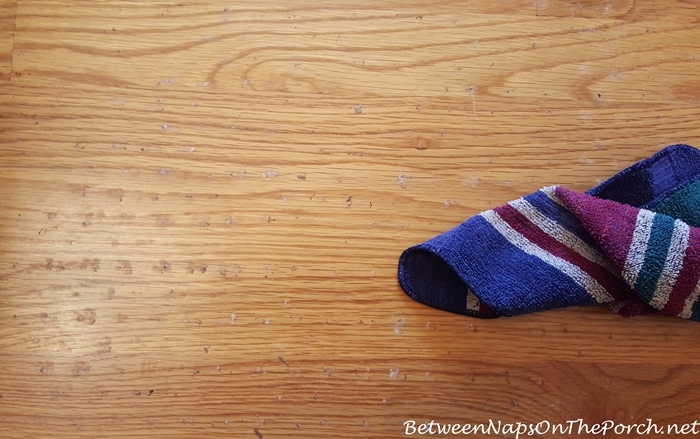 If there’s large chunks of dirt on the floor, sweep or vacuum these up first. It is best to use mops that are easy to get excess water out of. If you use a traditional cotton mop head, make sure to have a mop bucket with a space to wring out the water or you are going to spend a lot of time and energy doing this with your hands. If you don’t wring your mop out well, you risk causing water damage to your floor. In the worst case, the floor may warp or buckle causing an uneven walking surface or large cracks or splits. Water is not your friend when it comes to hardwood floors. Untreated surfaces that don’t have any protective coating will need regular application of wax or polish to maintain its looks and integrity. Make sure to remove old wax entirely before applying a new coat. You have a few options in applying polish or wax, the first and more efficient way would be a buffing machine but since these machines spin fast – there is more risk for injury. Second option would be using a mop like the Bona Motion Mop or Spray Mop. Read the label carefully because most polishes sold don’t polish. A lot of these are just fillers that fill in scratches. On the plus side these products are easy to apply even with a mop. But since it does not correct imperfections once it wears out your flooring will look like crap again. And you’ll need to reapply for it to look good again. True polishes contain chemical abrasives that are harsh on your lungs and may require you to use a buffing/polisher. If you choose these products, make sure to buy protective gear like masks and gloves. Although a door mat is technically not a tool for cleaning floors, there is no doubt that it will reduce how often and how intense you have to clean your floor. Placing a good quality door mat at each entryway and encouraging family and friends to use it will ensure that you spend as little time cleaning floors as possible and more time doing what you want to do. Make sure to buy good quality mats because they will pick up more dirt than thinner and less expensive ones. The AHIC warns against buying rugs with rubber backs because these can discolor wood flooring. When shopping for matts try to go to a wood flooring retailer and ask them for their recommendations. LL Bean makes a line of mats called Water Hog Door Mats that absorb a lot of water and catch pounds of dirt. And you don’t need it clean it as often as a regular door mat. The first step in cleaning your hardwood floor is to vacuum or dust mop the surface thoroughly to remove as much loose surface dirt and debris as possible. This is essential to getting a good result when it comes to cleaning hardwood. Without this step, you are just smearing a lot of dirt around. If you decide to go the dust mop route, experts say avoid lifting up the mop so the dirt stays on the fibers and not scratch the floor. Should you choose the vacuum cleaner route, preferably you should pick one without a motorized brush or if it has one opt for a model with an on/off option. There are vacuums like the Dyson V6/V8 and Shark DuoClean that offer a specialized tool for bare floors. Robotic vacuums like the ILIFE X5 do not have any motorized brush that can scratch the surface. Water and wood are like oil and water they don’t go well together. Excessive water on wood flooring can damage the finish and causing it to dull over time. Modern mops use microfiber cloth. These are soft, absorbent and lint-free. You have lots of options with these products. Some have a built-in wringer to wring out excess water. Others have a spinning system that works like a washing machine in a drying cycle. It is worth investing in a quality mop that has easy to find replacement heads. Use a cleaner specially formulated for wood with the damp mop, cleaners such as Murphy Oil Soap or Dr. Wood’s black soap. Make sure to read the instructions manual for the proper ratio (if you’re using concentrate). After soaking the mop onto your bucket with the water and cleaning solution completely wring out the mop. Remember we only need a damp mop not a soaking wet one. Mop in the direction of the grain. Repeat the process until you complete the whole area or room. Make sure that mops don’t have any surfaces that could scratch up your floor. Pushing too aggressively down on a hardwood floor with a low-quality mop can create scuffs and scratches. Depending on just how dirty the floor is you will need to rinse your mop out as needed. Change out water often in larger spaces. Some experts like Martha Stewart suggests something more extreme – scrubbing hardwood floors with a damp towel using your hand Mr. Miyagi style. Of course if you’ve got back or knee trouble, you’d want to avoid this technique. Even after thorough mopping, there will be hard-to-remove residue left. For these, it can be best to get a clean cloth and apply some cleaner directly on the spot and rub thoroughly. For very hard to remove spots you may need to let cleaner sit on the spot for a minute or two. Always rinse with a damp rag afterward, especially if using stronger cleaners. I’ve mentioned earlier in the article that to determine how you clean your wood floors, you must first determine the type of finish it has. The AHIC says that there are two main types of finishes – a penetrating finish and surface finish (most new homes have these type of finish). There are several ways to test what type of finish you have. First test would be running your fingers on the surface, if you can feel the wood grain the finish would be most likely a penetrating finish. Another way of testing is using a paint remover. Select an inconspicuous area in a room and apply a small amount of paint remover, if that area bubbles up then it is a surface finish. Another test would be using a scraper, again do this in low visible area. Using a blade try to scrap off the finish, if it comes out clear then your hardwood has a surface finish. Once you’ve determined the finish, it’s time to test whether or not it still does its job protecting the wood layer underneath. Get a tablespoon of water and drop in on a high traffic area. If water beads up, it means the protective finish is still intact. But if it slightly darkens, it means coating may have worn out (or at least partially). But if the initial drop leaves a dark spot then the finish has worn out and it will be time to recoat or refinish. Run your finger over the surface, if there’s not smudge then most likely it has a modern polyurethane finish. Count yourself lucky because this is the most durable coating out there and does a great job waterproofing. In some older homes, the floor may be unfinished. This type of hardwood needs waxing every 6 to 12 months. Experts recommend not exceeding this cycle. You also need to make sure to strip off any old wax or polish before applying a new coat. Homes with this type of finish use penetrating oil that that soaks into the wood grain. Penetrating oil contains hardening agents that strengthen the overall structure of wood, making it more durable compared to polyurethane. The biggest advantage of an oil finished hardwood is it usually never needs a refinish unlike polyurethane that may need more frequent recoating or even refinishing. Biggest downside would be more frequent maintenance with liquid or paste wax. So it can be more cumbersome for people. But this finish has a more “natural” look since it becomes part of the wood. Laquer and shellac works similar to polyurethane that it provides a protective outer coating to hardwood. It isn’t as durable as polyurethane it needs more frequent application. These finishes are also popular in those trying to maintain a period look in a home. Shellac was a popular treatment during the hey day of the Arts and Crafts and Craftsman home movement. Most shellacs available in the market come in liquid form. It’s also available in solid form or flakes. Experts recommend liquid shellacs for most homeowners because it’s easier to apply. Hardwood that has a laquer or shellac finish needs the same TLC as untreated hardwood, that means it needs regular wax application. We hope you enjoyed learning about how to take care best of your floor and extend the life and beauty of it. Keeping hardwood flooring immaculate not only makes your home look great, it’s also a great way to help mother earth. Imagine every homeowner doing their due diligence and maintaining their home’s flooring, it will greatly reduce the need to cut trees. A well maintained hardwood should last a few centuries and you can pass on this even to your great grandchildren. Please be sure to let your friends know about our informative articles and what they had to offer you and your family. Knowing how to properly maintain an important part of your home as a floor is a skill that will save you time and money over time. If you have any handy tips and advice, please comment on this article and help us improve the content we offer to our valued readers like you!